Movie remakes have long been Hollywood’s backup plan. In only the last 2 years we’ve received RoboCop, Endless Love, About Last Night, Poltergeist, Point Break, The Jungle Book and Ghostbusters. And there’s a staggering number more in development. I tend to greet each with guarded expectations given the middling success of most of them (The Jungle Book was a notable exception) . Given all the ways The Magnificent Seven could have been corrupted, it’s refreshing to see it got a lot right. Recycling the past is pretty common these days, but a remake of a remake? Well that’s kind of rare. 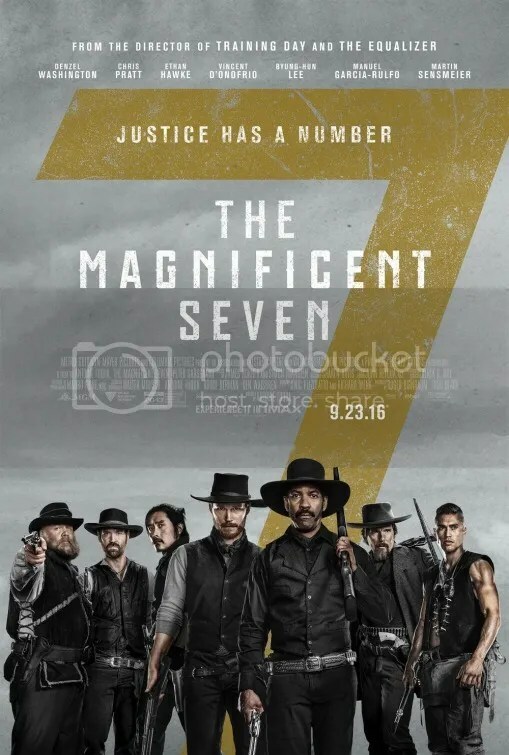 The Magnificent Seven is a new rendition of the classic 1960 western which was also a reworking of the 1954 Japanese epic Seven Samurai. There are still purists who view the John Sturges version as a pale imitation of the original. Although the 1960 interpretation has grown in such stature over the years that it has now become an accepted exemplar of the American western. The American Film Institute even listed it as one of the 100 most thrilling American movies of all time. So the 2016 adaptation begs the question: why redo it? I was pleasantly surprised. This reproduction could have been a lot worse. It sidestepped my worst fears. Director Antoine Fuqua has kept the setting in the 1870s. Screenwriters Richard Wenk and Nic Pizzolatto have preserved the relatively simple narrative. Keeping it as the straightforward western that it is, are among the picture’s strengths. Don’t fix what ain’t broke. The story concerns evil land baron Bartholomew Bogue (Peter Sarsgaard) who terrorizes the little mining town of Rose Creek. 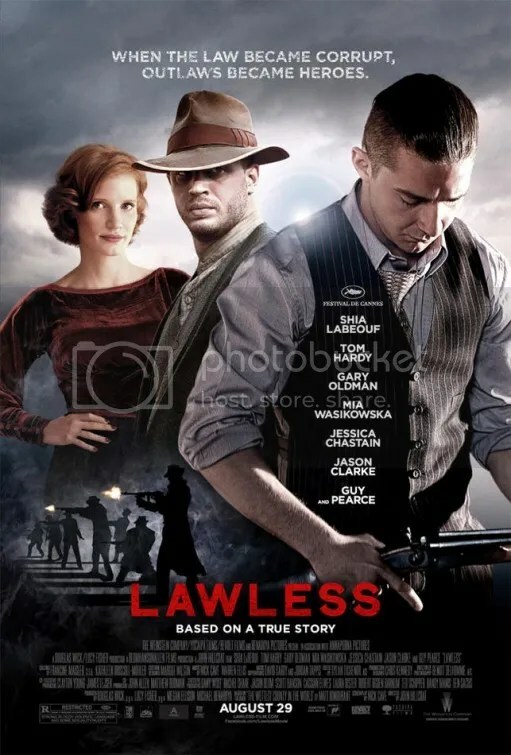 Townsfolk Emma Cullen (Haley Bennett), and her friend, Teddy Q (Luke Grimes) enlist bounty hunter Sam Chisolm (Denzel Washington) for help. Chisolm, in turn, assembles a team of 6 more gunslingers to help out. Fuqua assembles a racially diverse, all-star cast. Denzel Washington heads up the company. No stranger to his productions, Washington has worked with Fuqua twice before in his most monetarily successful flicks (Training Day, The Equalizer) when adjusted for inflation. There’s Josh Faraday (Chris Pratt), a hard-drinking gambler with a talent for explosives. He is joined by the sharpshooter with the coolest moniker Goodnight Robicheaux (Ethan Hawke), his assassin-with-a-knife partner, Asian immigrant Billy Rocks (Byung-hun Lee), big burly Jack Horne (Vincent D’Onofrio), a skilled but goofily unstable tracker, Comanche warrior without a tribe Red Harvest (Martin Sensmeier) and notorious Mexican outlaw Vasquez (Manuel Garcia-Rulfo). Granted, just roll calling the actors like this is a bit methodical, but it’s such an important component. They’re really the best thing about the movie. The charismatic ensemble is the most compelling argument to see The Magnificent Seven. Every film has the right to be judged on its own merits, but it’s unreasonable not to acknowledge previous versions in a remake. The modern casting is inventive. Simply watching Denzel Washington play the commanding leader of this posse of renegades has an appeal. He’s good in this context. Although the actors distinguish this production, it’s more of a cosmetic change than a substantive one. There’s charisma on display to be sure, particularly in the comedic moments from wisecracking Chris Pratt. “I believe that bear is wearing people clothes,” he says of Vincent D’Onofrio’s character. Yet the performers still come up a bit lacking in the charm department. That would have really put this adaptation over the top. Oh there’s plenty of rip-roaring shooting on display to distract from its deficiencies. However the bare bones story goes on for far too long. I’ll concede the originals were too lengthy as well. Fuqua could have remedied that with his interpretation, but he doesn’t. In contrast, this variant seems to mosey along at a sluggish pace. There’s no reason why we need such a protracted build-up to the final battle. The final confrontation is long and repetitive as well. Oh and really violent. Thousands are slaughtered in this shoot ’em up . The PG-13 rating just might be the funniest joke of the movie. If you watch this first, having never seen the John Sturges’ classic, you should enjoy it. It’s fine, but it’s not fresh or innovative or memorable or necessary. It’s disposable entertainment for a lazy afternoon matinee. The Magnificent Seven succeeds in that way. I’m pleasantly surprised. David Mackenzie’s neo-Western wasn’t even on my radar. I generally don’t expect much from the second week of August. That’s kind of a dead period for movie releases. The summer is winding down. Kids are gearing up for back-to-school and most major film studios have already issued their heavy hitters. Lionsgate is not one of the “Big Six” studios, so maybe it’s not surprising that such an awards-worthy production (and potential blockbuster) would have such an atypical release date. However Lionsgate IS the largest and most successful mini-major studio in North America, so I wouldn’t exactly classify them as an indie either. Regardless, I was prompted to watch this on a good recommendation. I’m so glad I did. 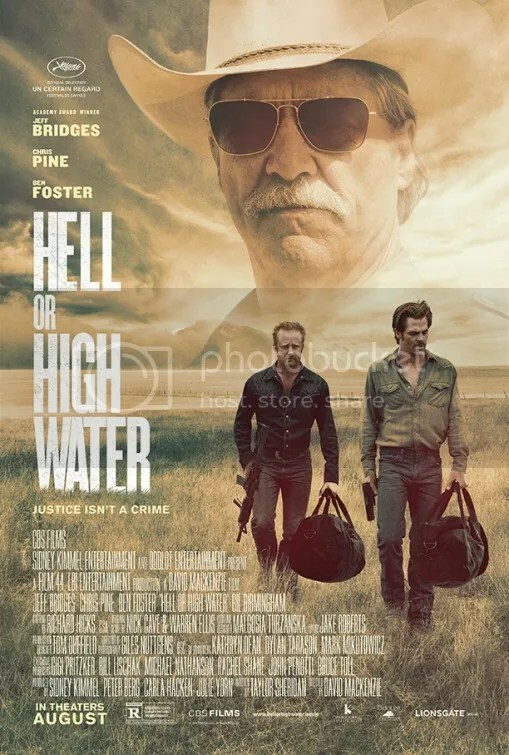 Since the traditional Western takes place in the later half of the 19th century, I probably shouldn’t place Hell or High Water in that genre. The setting is present-day West Texas. The American frontier setting certainly confuses things. It’s unquestionably a heist picture. On that everyone will agree. The story is simple. Two brothers, Toby and Tanner Howard (Chris Pine, Ben Foster respectively) plan a series of robberies targeting various branches of the Texas Midlands Bank in an effort to buy back their family farm. Texas Ranger Marcus Hamilton (Jeff Bridges) is in hot pursuit along with his partner, Alberto Parker (Gil Birmingham). The narrative details a series of stick-ups like you’d find in an old western but set in today’s modern day Texas. Scottish director David Mackenzie has an uncanny feel for this material. He is brilliant at establishing characters. His last movie, the underseen British prison drama Starred Up, also excelled in this area. Naturally a lot of credit should also go to the crackerjack script by Taylor Sheridan (Sicario). Gradually the screenwriter reveals layers to these brothers, Toby and Tanner. At first the two appear to be one and the same – bank robbers. As the chronicle develops, we’re given motives and backstories and emotional temperaments that play out in little dialogues with various people along the way. Each vignette uncovers more depth to these people. A flirtatious conversation with Toby from a waitress (a noteworthy Katy Mixon) in a diner, is deceptively mundane taken at face value. Yet her wistful exchange exposes a heartbreaking yearning for so much more in her life. She’s merely one component in an incredible ensemble. Jeff Bridges is Marcus Hamilton. The grizzled, old fashioned Texas ranger is not such a stretch for the veteran actor anymore. Still, he’s wonderful. Ditto his partner Alberto Parker, a marshal whose half-Comanche/half-Mexican roots are subject to his constant teasing. The focus revolves around their pursuit of the brothers. The younger duo is united in the same dirty business, but they are rather different. Ben Foster has always been a bit of a chameleon. He’s mesmerizing. His portrayal is just as intense as you’d expect. However Chris Pine’s soulful work is the performance of his career. His understated achievement is so quietly expressive. I thought I knew the actor. He’s a revelation. In this account, no one person is all good or all bad. Toby and Tanner are clearly in the wrong. Yet we are given valid reasons to hate these financial institutions – the source of foreclosed houses and crushed dreams. Are these brothers a modern day Bonnie and Clyde? Or perhaps Butch Cassidy and the Sundance Kid. Not exactly, although you’d be forgiven for making the connection. Rooting for these guys is similarly problematic, but this is a tale with even deeper shades of gray. There are so many surprises. One violent altercation inadvertently provides a cogent defense for carrying a concealed weapon. The mentality of the vigilante perspective is presented so rationally, I was a bit taken aback. There’s sort of an odd mix of emotion that fluctuates wildly between compassion and disgust for these lawbreakers. Sympathy turns to aversion over the course of the narrative. It’s the way these little unforeseen vignettes plays out that make this character study so captivating. One of the most noteworthy dramas of 2016. From Amores Perros to Babel to Biutiful to Birdman, director Alejandro González Iñárritu deals in dark, sometimes cruel subject matter. His latest is no different. 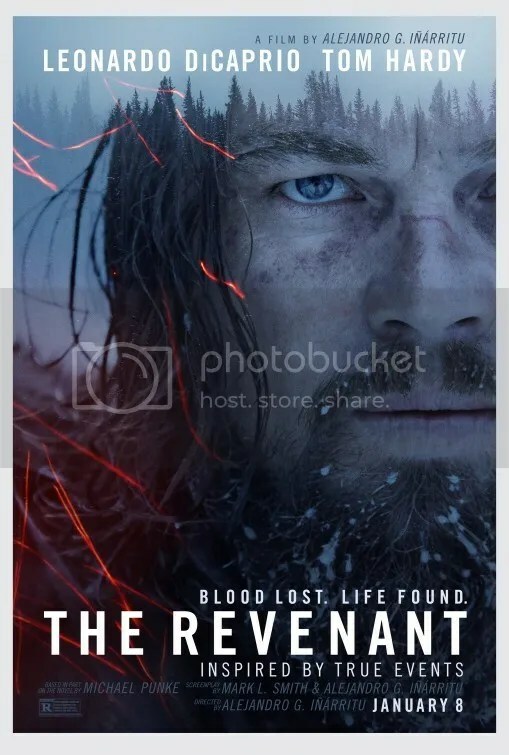 The Revenant recounts the tale of real-life 19th century fur trapper Hugh Glass, an American frontiersman who who became sort of a folk hero after surviving a bear attack. Then he is left to die by the two the men assigned to take care of him [John Fitzgerald (Tom Hardy) and Jim Bridger (Will Poulter)]. Hugh sets out to find his way back to their outpost under the command of Captain Andrew Henry (Domhnall Gleeson). He’s mainly trying to stay alive, but he also seeks retribution. Hugh Glass has been documented in numerous books and was the subject of the feature film Man in the Wilderness (1971) starring Richard Harris. This production is based on a fictional 2002 novel by Michael Punke, inspired by real events. Once again, Iñárritu has reunited with cinematographer Emmanuel Lubezki. The partnership is integral to the success of the picture. Set in the American Rockies in the 1820s, the shoot stretched over 9 months in the inhospitable Canadian Rockies northwest of Calgary often in subzero temperatures. However the ending was photographed in Argentina after the weather became too warm. No computer graphics or green screen technology was used to simulate the environment. These are actual people suffering barbaric conditions. The atmosphere has a physicality you cannot fake. The Revenant has some of the most ravishing cinematography I have ever seen. Lubezki or “Chivo” shot on location using only natural light. He presents these snow covered vistas with a visual grandeur that is never less than breathtaking. With this work of art, Emmanuel Lubezki now ascends the shortlist for greatest cinematographer of all time. With his back to back wins at the Oscar, a 3rd would be unprecedented but equally well deserved. The quiet majesty present in his work here makes violent events and a harsh weather look strikingly beautiful. By all accounts, this was not an easy shoot. He, like Hugh Glass, tames the wilderness. He brings out the panoramic beauty of this unforgiving climate. I want develop stills from this movie and make a coffee table book. However his effort would be in service of nothing if not for the human presence at the narrative’s center. Leonardo DiCaprio captivates the viewer’s attention with a physically demanding role. After one particularly memorable scene, his achievement becomes an almost wordless performance. Early talk focused around the scene where he is mauled by a bear. It is a stunning achievement that combines CGI with stunt people to create a visceral episode like no other. You will feel what it’s like to come face-to-face with an animal of that magnitude. It’s an immersive demonstration that will have you gripping your armrests in the theater. It’s that vital authenticity that makes this the emotionally compelling spectacle that it is. The heart of The Revenant is centered around an absolute pedal to the metal performance by Leonard DiCaprio as the dirty, rugged mountain man. His survival odyssey is an emotional and physical journey conveyed without words. Hugh Glass travels some 200–300 miles often on his stomach clawing at the ground,. He forages for food, floats down rapids, jumps off a cliff and is followed by hostile Native American Arikara Indians across present day South Dakota,. At three hours, it’s pretty exhausting, but it never feels tedious. At one point, his quick thinking allows him to stay warm in a most ingenuous way that you have to see to believe. It’s creative touches like this that elevate the production into something we want to embrace. The punishing cold, the festering wounds – you will feel every brutal hand that this poor fellow is dealt. The movie is primal. The Revenant isn’t just a film, it’s an experience. Before I begin my review, I must commend Quentin Tarantino for his commitment to cinematic style. The director has always been a student of film. He loves the medium and is well versed in its history. His latest was photographed using Ultra Panavision 70, a widescreen process usually preceded in print by the adjective “glorious”. It employs an anamorphic camera lens that allows for an extremely expanded aspect ratio of 2.76:1. The technology became obsolete due to cost. Most 70mm movies were also simultaneously released on 35mm for broader distribution. The format was only used on 11 pictures during the 1950s and 60s including Ben-Hur (1959) and Mutiny on the Bounty (1962). The last being Khartoum in 1966. That is until now. The Hateful Eight was initially released on Christmas Day to 100 theaters in a special “Roadshow” prestation complete with overture, an intermission and a souvenir program. For two weeks people could see the picture as Tarantino had originally intended. In this age of digital projection systems, This meant that the Weinstein Company had to equip theaters with 70mm projectors just so they could play the print. Then they had to train staff so they could properly monitor the projector as it was being shown. In theory, the format allows for an unmatched experience of wider dimension, resolution and artistry that should make for a richer cinematic experience. An experienced projectionist is clearly a rarity these days because complaints of screening problems at the Roadshow engagements have been rampant on the Internet. Indeed at my showing, the movie was interrupted no less than 5 times during the presentation. At one point the film actually stoped and you could see it literally burn on the screen. Whoopsie! Additionally focus problems infested the entire picture, with parts of the image being crystal clear and others being incredibly blurry. None of this has anything to do with the quality of the feature, but it certainly doesn’t help that The Hateful Eight is (wait for it) a hateful film. I don’t even know what constitutes the worst offense, but let’s start with the story. This dark comedic riff on the Western takes place post-Civil War. Bounty hunter John “The Hangman” Ruth (Kurt Russell) and his fugitive prisoner (Jennifer Jason Leigh) are traveling by stagecoach to the town of Red Rock, Wyoming. Along the way they encounter another bounty hunter (Samuel L. Jackson) and a man who claims to be the sheriff of that town (Walton Goggins). These four must soon seek shelter from a blizzard. It is there, in a little general store called Minnie’s Haberdashery, that they meet four more degenerates (Demián Bichir, Tim Roth, Michael Madsen, Bruce Dern). The Hateful Eight is a step back for Tarantino in the storytelling department. Bill Desowitz over at Indiewire noted the plot suggests Agatha Christie’s And Then There Were None as well as the films Stagecoach and The Desperate Hours. That’s fairly apt, although the manner in which the script cobbles those inspirations is an absolute bastardization of far superior references. For the first half, everything unfolds in the tiny compartment of a covered wagon. Things culminate at a rest stop when Major Marquis Warren (Jackson) taunts General Sandy Smithers (Dern) with a tale of what transpired when he met the former Confederate general’s son. The speech is memorable but it’s the lone highlight of a nearly 90 minute intro that is all talk. Well that, and frequent jabs to the face of Daisy Domergue. She enters the movie with a black eye and things only get worse. She seems to relish each assault she endures with a smile of masochistic glee. I guess we’re supposed to view her battery with apathy because she’s such a nasty person. Actually everyone is despicable. Hence the title. Daisy uses the N-word so many times I grew desensitized to its meaning. After awhile she might as well been calling Samuel L. Jackson a nincompoop. The proper story begins in the second half when the ongoing talk-fest is punctuated by bursts of cartoonish violence that are clearly meant to be funny. Sadly they aren’t. Or rather thankfully, if you think deriving joy from murder is a bad thing. This is nothing new for Tarantino. There will be blood. You know what you’re going to get, but here it feels childish and immature, like a 5 year old that has only recently discovered that there’s a red crayon in that box of Crayolas and has decided to cover every page in red wax. People projectile vomit blood. A character is shot in the groin. Someone’s head is playfully blown off in cartoon fashion without any warning whatsoever. Can you build a whole comedy around shock death? I’m not laughing. Quentin Tarantino has a lot of power. How many studios would give a director carte blanche to make a film this empty. The plot of this simple drama could’ve been the basis of a brisk 90 minute chamber play. Instead the chronicle is stretched to the elephantine length of over three hours. That includes a 12-minute intermission. That’s fine if we’re talking epics like Gone with the Wind or Lawrence of Arabia. However it’s the height of Ultra Panavision 70 irony that the majority of the production takes place in the single room of a dark claustrophobic den of a set. Add to that narrative a complete cast of characters we couldn’t even give a care about. These people talk so much that when the bodies start dropping, it’s a relief because that’s when they stop yapping. Don’t get me wrong. A long winded drama can be enjoyable if it has substance, but even the script lacks the snappy zing that usually typifies Tarantino’s work. These are awful people that say ugly things. 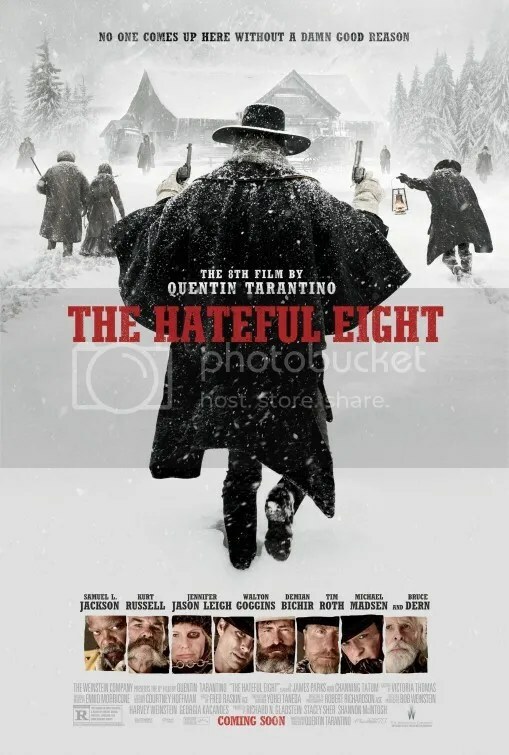 The Hateful Eight is the soulless work of an auteur that has set the majority of a 3 hour production in a dark room, but then filmed it all in a “gloriously” expensive widescreen process, simply because he can. In post-apocalyptic Australia, a drifter (Guy Pearce) hunts down the three 3 thieves that stole his car. That’s it. That’s the whole plot. The Rover is set “ten years after the collapse.” At least that’s what the title card tells us. It’s all the information we’re given in the sketchy history of an apparent global economic meltdown in the near future. The end credits inform us that our protagonist is Eric, though I don’t recall anyone ever uttering his name. Eric rarely speaks. Instead he effects his way through the story employing pseudo-macho grumbles and growls designed to intimidate all who stand in the way of the aforementioned car. Eric spends most of the 102 minutes tracking this criminal trio, played by Scoot McNairy, David Field and Tawanda Manyimo. We really don’t see much of them except for in the very beginning and at the very end. In time, Eric is joined in his dreary quest by the mentally challenged brother of McNairy’s character. Played by a mumbling Robert Pattinson, the Twilight star becomes sort of a sidekick. Pattinson is good. Sadly the movie is not. 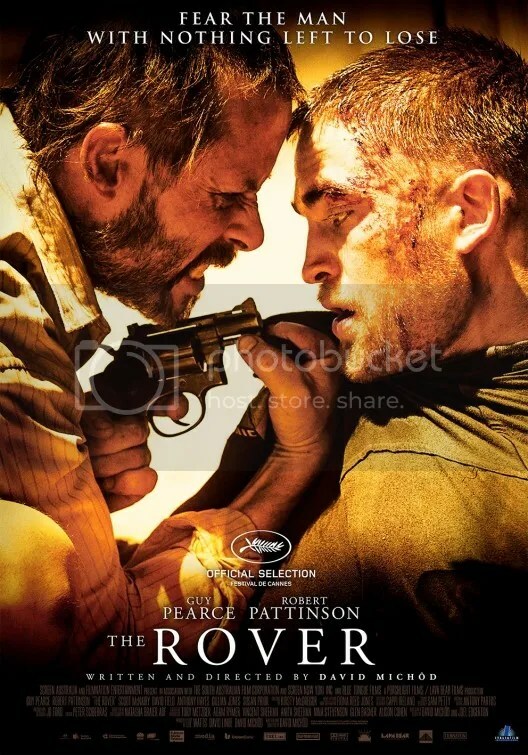 The Rover has a particular disregard for human life. Director David Michôd’s follow up to his brilliant Animal Kingdom is simplistic and dull where that 2010 crime thriller was layered and complex. The Rover is unrelentingly bleak, depressing, savage. I could go on. Any number of various adjectives don’t do justice to this grim tale about life. This post apocalyptic western has been compared to Mad Max. No way. That film was a tightly edited action packed classic compared to this downbeat, depressing, lethargic mood piece. Occasionally the audience is visually assaulted. The lawless world of The Rover is punctuated by some of the most unpredictable bursts of violence I have ever experienced. I’m talking bloody shots of people at point blank range right in the face. Director David Michôd has a latent contempt for his audience. There is no story, only the violent pursuit of one man’s bloodthirsty fixation on his stolen car. His search is occasionally disrupted by gunshots that are disproportionately loud to anything else happening on screen. The camera does not turn away from these bursts of noise but rather it lingers on the atrocities with a disgusting gaze. Why this stupid car is so important to Eric is a question that will nag at you for the duration of the entire movie. To be fair, we are finally given an answer for enduring this slog through a nihilistic wasteland. Unfortunately, it simply doesn’t justify everything we had to endure. The show isn’t a complete waste. At one point, Robert Pattinson’s character finds himself alone in the car singing along to Keri Hilson’s “Pretty Girl Rock.” It’s a bright, shining moment of energy that is completely out of step with the rest of this dull flick. And for that reason it’s the best scene in the entire picture. Taste is debatable, but comedy is the most subjective of genres. I have always maintained this and will continue to do so. Don’t believe me? Millions of fans flocked to see Grown Ups 2 in 2013 much to the chagrin of the cognoscenti. Meanwhile in that every same year, audiences largely ignored critical darling The Way, Way Back, a far superior comedy in my opinion. Show me a person who doesn’t giggle once watching Office Space and I’ll show you someone who thinks it’s the funniest classic of the last 15 years. Unlike adventure, drama, romance or even horror, a good farce isn’t as reliant on quality. It simply needs to make you laugh. Sometimes a witty observation is all it takes, other times it’s a complex visual gag. Humor is in the mind of the beholder. 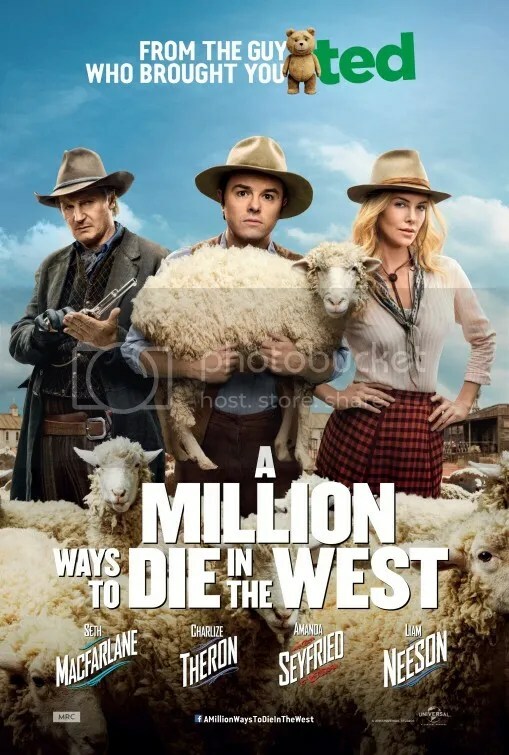 A Million Ways to Die in the West is a movie that made me chuckle. Quite a lot in fact. Arizona in 1882 is a land meant for the rough and tumble macho cowboys of the Old West. Enter Albert Stark, a cowardly man who herds sheep. Writer/director/star Seth MacFarlane is a fish out of water very much in same spirit as Bob Hope in The Paleface (1948) or Don Knotts in its remake The Shakiest Gun in the West (1968). Right from the start we can see that Albert would rather tell jokes to get out of a tough situation than face a shootout with an outlaw. He makes crude gestures using the shadow of his opponent. It’s hysterical on one level because it’s a juvenile prank, but it’s also amusing because the shadow puppets are so unbelievably elaborate, no one could possibly do them. The layers is what makes the gag powerful and understanding that adds to its brilliance. Sadly some of the bits fail. The pacing is already really slow and this picture feels overlong by about 30 minutes. It’s easy to see where cuts could’ve been made. Even the most sophisticated of us will laugh at scatological humor in the right context. Unfortunately, Seth MacFarlane too often wanders down that path. Foy (Neil Patrick Harris) is the mustachioed businessman who stole his girlfriend (Amanda Seyfried). It’s nice to see him get his comeuppance, but that doesn’t include what happens after Foy is slipped a laxative in his beer. Likewise the repetitive hammering of the same schtick doesn’t increase its punch, only time to the excessive length of the movie. Case in point. The town prostitute (Sarah Silverman) will sleep with anyone at the drop of a hat for money, yet is saving herself for marriage by abstaining with her boyfriend (Giovanni Ribisi). She is a good Christian woman for goodness sake! The joke is slightly amusing once, but not over and over throughout the entire film. Seth MacFarlane plays Albert Stark like a modern man from 2014 plopped down in the middle of the Old West. Anachronistic humor abounds. This gives him ample opportunity to riff on the difficulty of living on the wild frontier. Seth MacFarlane extracts wit in things that we have always known, but rarely stopped to think about. The idiosyncrasies of the era are mined for jokes. Whether it be that nobody ever smiled in photographs or that medicine was so bad, going to the doctor could actually make you sicker. Most of his targets are clever and unique. At times it’s almost like a stand-up act. He exploits simple but obscure truths out loud. That makes them effective. There are several cameos too and every single one of them is a riot. Just don’t watch the trailer because it will spoil the best one. MacFarlane has nice chemistry with Charlize Theron who plays Anna, the wife of a notorious outlaw. When she busts up at his shenanigans, you genuinely feel like she’s not just acting. She truly thinks he’s funny. I have to admit, I do too. 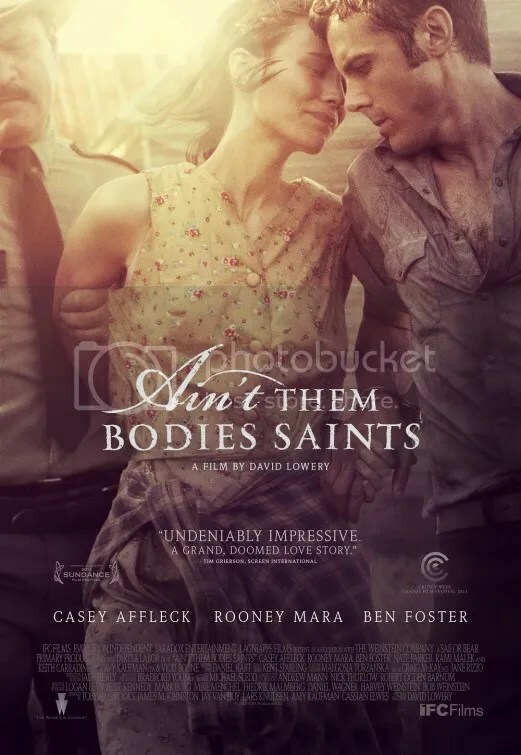 For all its artistry, Ain’t Them Bodies Saints is saddled with one of the worst movie titles in recent memory. Watching the film will not shed any light on what that cryptic title means. Apparently director David Lowery misheard the lyrics in an old folk song many years ago but liked the sound of the phrase anyway. They have absolutely no significance other than interesting sounding words to convey a time period. In many ways that’s appropriate because David Lowery’s meditation on a western is more concerned with milieu than meaning anyway. Casey Affleck and Rooney Mara are engaging. They play a couple kept apart after a getaway gone wrong from a botched robbery. Bob agrees to take the fall for a violent act for which his wife Ruth is in fact responsible. This then is the emotional chronicle of outlaws whose exalted devotion is made more relevant than what they’ve actually done. Their romance is boiled down to its essence. We learn Ruth is pregnant with their daughter. Bob vows to reunite with his wife, prison sentence be damned. His undying dedication to her is a key theme. That Bob and Ruth love each other is obvious. There is a pure naturalism to their behavior. They express a lot with very few words. Conversation is secondary as the atmosphere is what’s important. Matching them is Ben Foster who plays the deputy who warms up to Ruth oblivious that it was she who indeed shot him. He’s memorable as a third wheel. Keith Carradine also gives a notable performance as their neighbor who has become sort of a father figure to Bob. Ain’t Them Bodies Saints is a stunningly beautiful picture with a score to match. The drama is set against the backdrop of 1970s Texas Hill Country. However there’s a timelessness that makes this saga feel as if it could’ve happened even further in the past. Their homestead takes on an ethereal beauty far beyond the modest farmhouse where they live in reality. The aura at once recalls depression era photographs of Dorethea Lange or Andrew Wyeth’s “Christina’s World”. But it’s even more hewn from Terrence Malick’s Badlands and to a lesser extent Days of Heaven. David Lowery is unquestionably a director to watch, yet he’s fashioned a film that’s easy to admire but a hard one to truly enjoy. Lowery exploits the neo-western ethos in a way that luxuriates in ambience but at the expense of a strong narrative. If you champion appearances over depth, you‘ll find much to cherish here. The elegant lyricism will charm anyone more captivated by a mood than well-defined storytelling. Its melancholy tone will seduce style mongers into heaven. Django Unchained is Quentin Tarantino’s full bodied and bloody take on the spaghetti western with a little 70’s era blaxploitation thrown in. Taking place in the pre-Civil War South, the plot concerns a freed slave who takes revenge on a plantation owner in order to rescue his wife. Our story begins with Dr. King Schultz, a former dentist. He’s now a bounty hunter seeking the Brittle brothers, dangerous outlaws with a price on their heads. 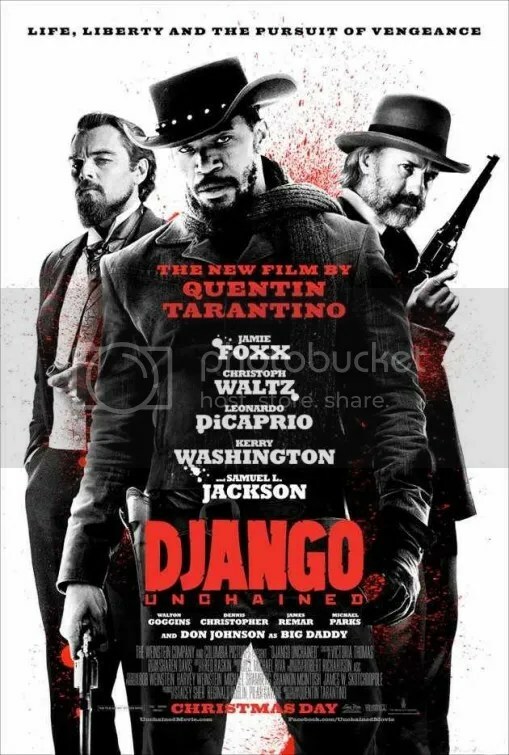 Since Django is the only one who can identify the perpetrators, he buys Django, essentially freeing him, and the two set off to find them. Jaime Foxx is all seething rage with a perpetual scowl across his face as he matures from helpless slave to an avenging superhero. He’s the obvious star but the supporting cast is nothing less than perfection. The movie is stolen by a trio of actors that command attention in every scene they’re in. Christoph Waltz displays a gentle charm as the enlightened German bounty hunter that is both sympathetic and fearsome. Leonardo DiCaprio is the central villain, a hissable plantation owner named Calvin Candie. He’s guilty of a whole slew of offenses, not the least of which includes pitting slaves against each other for gladiator-like competitions to the death. But he spits his declarations with a smooth southern drawl that would just as likely offer his guests a Mint Julep. It’s a spellbinding performance, one that establishes a demented personality. Possibly even more unsettling is Samuel L Jackson as house slave Stephen, obediently loyal to Calvin’s desires but vile and ill-tempered to everyone else. It’s a villain that might trump DiCaprio’s hateful character for selling out his fellow man. He’s respectful to Calvin, but lords it over the rest of the house as an intense individual to be feared. It’s a portrayal of a slave unlike any I’ve ever seen. Tarantino has an ear for conversation and his comedic instincts are razor sharp. The opening scene in which Dr. King Schultz buys Django from the Speck brothers is a brilliant start. Schultz’s educated manner when contrasted to the more unsophisticated personalities of the Specks makes for a rather lighthearted negotiation in the midst of tense circumstances. Later a scene in which proto-KKK members complain about the poorly cut eye-holes in their white masks is a model of hilarious writing. No wonder it tied at the St. Louis Film Critics Association for Best Scene of the year. And let’s not forget the assertions of Calvin Candie. Once Leonardo DiCaprio turns the tables on our heroes, he offers his misinformed thoughts regarding cranial anatomy. His frightening and pseudo-intellectual ideas are so shockingly bizarre, you are compelled to listen. It’s Tarantino, so of course we’re going to get anachronistic style choices. But there are some seriously questionable music selections going on. It’s all over the place. Since Django Unchained is inspired in part by Sergio Corbucci’s 1966 Italian Western Django, it makes perfect sense he would appropriate Luis Enrique Bacalov’s theme song over the opening credits. Even Jim Croce’s ‘I Got a Name’ has enough country western flair to sound germane to the time period, but rapper Rick Ross’ ‘100 Black Coffins’ is painfully out of place. It takes you completely out of the mid 1800’s and into 2012. Ditto the mashup of James Brown’s ‘The Payback’ and Tupac Shakur’s ‘Untouchable’ called ‘Unchained‘. It’s a rousing rap blast, but it doesn’t’ do the picture any favors. Like Tarantino’s earlier revisionist history flick Inglourious Basterds was to Nazis, Django Unchained offers a generous helping of comeuppance to slaveholders and their kin. But this isn’t as inventive as that film. Don’t get me wrong. Django is good. It’s filled with great dialogue. And it’s acted to the hilt by the entire cast with Waltz, DiCaprio, and Jackson mesmerizing in their parts, any of which, are worthy of an Academy Award. But the nearly 3 hour running time really meanders. One might argue that this revenge fantasy doesn’t really get started until well past the halfway point where the real purpose of rescuing Django’s wife Broomhilda becomes the goal. Then the whole production climaxes in the most mundane way possible: a shootout. As Django delivers restitution to each baddie, their bodies shot through with holes, blood literally gushing out like fountains. It’s supposed to be visceral. Lighten up, right? It’s a cartoon! But it’s pretty disturbing too and I don’t care how desensitized to violence you are, if you aren’t at least a little disgusted, you might see a doctor for sociopathic tendencies. But even more problematic, it feels like a cheat – a simplistic shortcut in lieu of a more creative ending that would match the subversiveness of everything that lead up to that moment. Make no mistake, Django Unchained is really entertaining. It just could’ve been so much more. 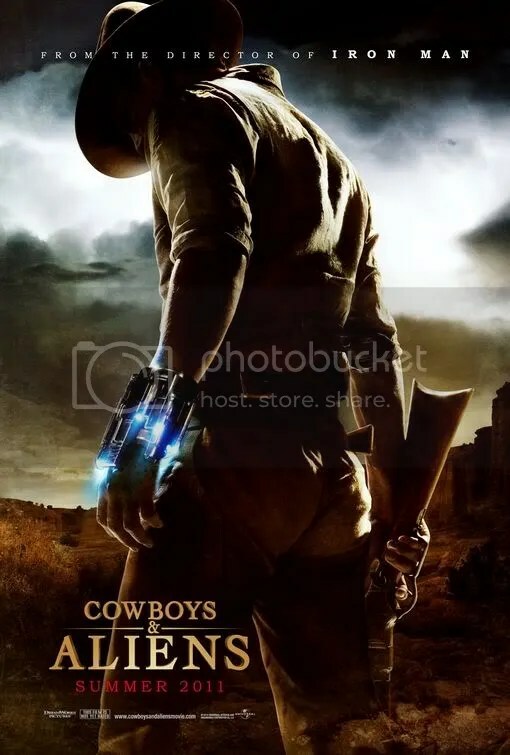 Cowboys & Aliens is a discordant, headache inducing mess. It’s unclear whether the filmmakers meant this to be a silly, light hearted adventure or a serious sci-fi adaptation. A case could be made for either. Harrison Ford plays Col. Woodrow Dolarhyde whose successful cattle business provides the small town of Absolution with its main source of income. He growls every line in a performance that is rooted firmly in camp. His gravel voice makes Clint Eastwood’s in Gran Torino look downright mellifluous by comparison. Dolarhyde and his son Percy act as though they are above the law and they initially emerge as the chief antagonists. Daniel Craig is Jake Lonergan, the apparent hero, but deeply humorless with nary a smile. He has amnesia right from the opening scene. He appears to be a fugitive from the law based on the shackle cuffed to his wrist. But he stands up for righteousness when he opposes Dolarhyde’s son who terrorizes the town. The first third of the film feels like a classic western of good vs. evil. It’s the best part. Although the setup is clichéd, at least it does a satisfactory job of laying the groundwork for the possibility of something exciting to come. Unfortunately the story takes a turn for the worse. Technologically advanced flying objects appear overhead and abduct many of the townsfolk. This being a western set in 1873, the anachronism could have had a significant impact. Apparently this development was not meant to be a shock since the very title gives this revelation away. Even the trailer highlighted this spectacle. Without the element of surprise, the movie lacks excitement. Even the citizens seem rather unperturbed. Lots of blasts and explosions are presented in a blazing cacophony of CGI. The intruders are overly complicated monsters that scream “check out these creature designs!” to the Academy. The visual flourishes are plentiful, but the narrative is dull. Sadly Ford and Craig never fully connect and the promised sparks between the meeting of Indiana Jones with James Bond fail to ignite. We’re also introduced to a mysterious woman who joins the group and a Native American man who is Dolarhyde’s second-in-command. They have back-stories, but they seemed perfunctory. Where the aliens come from and their purpose, have routine explanations as well.